In thinking about the Holocaust, Nazi Germany’s project to exterminate Europe’s Jewish population, words like “incomprehensible” or “unfathomable” often come to mind as the only adequate descriptors. How could Germany, that cultured land of Beethoven and Bach, Hegel and Kant, become the country of mass murderers Hitler and Himmler? 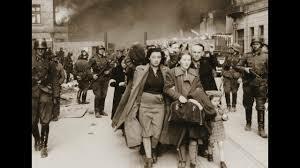 How could so many “ordinary Germans,” to borrow a phrase from the Holocaust debate, buy into, support, and participate in crimes of this enormity? Rational, evidence-based responses to such questions frequently seem inadequate. Might the Holocaust be a subject for which the conventional tools of historical explanation are insufficient? Not at all, Peter Hayes argues in Why: Explaining the Holocaust, where he applies the conventional tools to identify and answer the most critical questions about the Holocaust. Characterizing the Holocaust as “incomprehensible” or “unfathomable,” Hayes writes, leads us to “despair, to give up, to admit to being too lazy to make the long effort, and, worst of all, to duck the challenge to our most cherished illusions about ourselves and each other that looking into the abyss of this subject entails” (p.326; disclosure: I have used the word “unfathomable” to describe the Holocaust on several occasions on this blog; e.g. here, 4th paragraph; here, final paragraph). Hayes, professor emeritus at Northwestern University, Chair of the Academic Committee of the United States Holocaust Memorial Museum, and the author of numerous works on Nazi Germany and the Holocaust, recognizes that a “coherent explanation of why such ghastly carnage erupted from the heart of civilized Europe in the twentieth century seems still to elude people” (p.xiii). But he asks that we approach the Holocaust “neither in awe nor in anger,” viewing it as a “set of historical events, to be recovered, studied and comprehended by the usual historical means,” that is, “‘carefully and soberly,’ with a mix of precision and feeling, and without engaging in sentimentality or sanctification” (p.325). The alternative to trying to understand how and why the Holocaust happened is to “capitulate to a belief in fate, divine purpose, or sheer randomness in human events” (p.326). Annihilation: Why This Swift and Sweeping? Victims: Why Didn’t More Jews Fight Back More Often? Onlookers: Why Such Limited Help from the Outside? For each question, Hayes provides his assessment and summation of the state of current scholarship and research on that aspect of the Holocaust. In his final chapter, “Aftermath,” he asks: “What Legacies, What Lessons?” Given the proliferation of specialized research on the Holocaust, Hayes offers his readers what he terms a “comprehensive stocktaking directed squarely at answering the most central and enduring questions about why and how the massacre of European Jewry unfolded” (p.xvi). His book thus serves as a compact primer on the scholarship involving the Holocaust, rendering it a valuable device to see a dense and intimidating forest through its many trees. 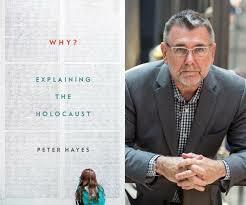 Hayes’ evidence-based answers to the book’s seven questions build a narrative of a “perfect storm,” in which centuries of antipathy toward Jews culminated in the enormous crimes of the Holocaust, fueled by Adolph Hitler’s murderous ideology that posited Jews as Germany’s implacable enemy. The initial chapter, “Targets: Why the Jews,” contains an overview of this antipathy, “deeply rooted in religious rivalry and superstition” (p.35). Underlying Christian Europe’s historic hostility toward Jews is the notion that Jews had “common repellent and/or ruinous qualities that set them apart from non-Jews. Descent is determinative; individuality is illusory” (p. 3). The latter half of the 19th century gave rise to what we might term “modern anti-Semitism.” In 1879, the word “anti-Semitism” itself entered into popular usage — an inapt, artificial word, Hayes points out, targeting speakers of Semitic languages, whose syntax and grammatical structure is different from standard European languages, yet largely exempting speakers of Arabic, also a Semitic language (Hayes also prefers the Hebrew word “Shoah,” meaning destruction, to “Holocaust,” derived from the ancient Greek term for an “offering totally consumed by fire,” i.e. a religious sacrifice). In the same time frame, pseudo-scientific racial theories based on eugenics came into vogue to justify discrimination against Jews. By the late 19th century, Hayes notes, overt hostility toward Jews correlated closely with the economy, becoming more severe during economic downturns. It was generally harshest in Russia and Eastern Europe, Germany and the Austrian portions of the Hapsburg Empire. “Attackers: Why the Germans” explores the particularities of anti-Semitism in German speaking lands from the 19th century through the rise of Adolph Hitler’s Nazi party during the Great Depression of the late 1920s, but prior to Hitler’s appointment as Weimar Germany’s Chancellor in January 1933. Even before Germany became a unified state in 1871, 19th century nationalism in German-speaking lands tended to be less inclusive and more tribal than that in Britain or France. Having developed in reaction to and rejection of the French conquest and occupation under Napoleon, German nationalism “crystallized around the only idea that could unite so much difference, the notion that all the tribes were related and parts of a common people, or Volk” (p.38), a notion that left little room for outsiders, especially Jews. Before World War I, however, anti-Semitism in Germany was “loud, quotable, recurrent, but it had little political traction or legislative success” (p.44). Germany’s defeat in World War I provided the basis for political traction. The myth of the “stab in the back” quickly arose in the aftermath of the defeat: the German army had been on the cusp of victory in the field, only to be undermined on the home front by an insidious coalition of Jews and leftists. By this time, German anti-Semitism had been further linked to Bolshevism in the Soviet Union and the specter of violent revolution throughout Germany and Europe. In this environment, Hitler’s toxic brand of anti-Semitism thrived, a “witches’ brew of self-pity, entitlement, and aggression, but simultaneously a “form of magical thinking that promised to end all of Germans’ postwar sufferings, the products of defeat and deceit, by banishing their supposed ultimate cause, the Jews and their agents” (p.65). Hayes describes Hitler’s ideology as a “bastardized Marxism that substituted race for class” (p.61), in which history is the struggle among races to control space or territory and the Jews are Germany’s most implacable enemy. The Nazis’ relentless effort to portray the persecution of Jews as acts of self-defense is critical to understanding the subsequent Holocaust, Hayes emphasizes, “so essential as a justification for what the Nazis wanted to do that it repeatedly appears in new forms: They threaten us, so we must strike to protect ourselves” (p.60-61). But the immediate force behind Hitler’s rise to power was the widespread economic crisis of the Great Depression. Contrary to widely held popular belief, Hayes stresses that anti-Semitism did not play a decisive or primary role in bringing the Nazis to power. Most Germans who voted for the Nazi party did so in spite of its anti-Semitism, not because of it. Germany’s dire economic situation increased receptivity to the Nazi message and reduced anti-Semitism as a disqualifier for office. At a time when no political party appeared to have a plan to deal with the economy, the Nazis seemed more dynamic to many Germans than the other major parties: they were authoritarian, unalterably opposed to the faltering Weimer democracy, and able to get things done. The promise of Nazism was to “restore all that was best in Germany’s traditions yet also to revolutionize the country” (p.68). But without the collusion of conservative leaders, who expected to use Hitler for their purposes during the economic crisis, the Nazis would not have come to power. In his middle chapters, Hayes explains how the project to exterminate Germany’s Jewish population came about in increments once the Nazis gained power in 1933. Despite what Hitler had said in Mein Kampf, it was in no sense inevitable or preordained that extermination would become the Nazi end game. Nazi policy at the outset concentrated on harassment, intimidation, isolation and dispossession, but stopped short of killing, even though killing metaphors were part of everyday Nazi rhetoric. At the core of the Nazi vision was an “unwavering dream of a Jew-free environment, since that was a precondition of German strength and happiness” (p.65). During the Nazis’ early years in power, Germans divided generally into three groups: “people who endorsed the persecution of the Jews, people who merely accepted it, and people who disliked it but saw little point in protesting, even though they frequently expressed reservations or felt embarrassed about specific actions” (p.98). Prior to the savage riots of November 1938 known as Kristallnacht, German public opinion generally accepted anti-Semitic policies “except when they threatened the self-interest of non-Jews” (p.99). Violence and viciousness toward Jews “increased steadily during the 1930s in Nazi Germany and in full public view . . . yet the pattern gave rise to too little rejection or revulsion to make the Nazi regime change course” (p.99-100). The point at which persecution gave way to mass killing most likely occurred sometime in the second half of 1941, the outgrowth of a series of meetings between Hitler and Himmler after Germany had invaded the Soviet Union in June of that year. In October 1941, Himmler issued an instruction that forbade further emigration of Jews from the European continent. This document “clearly signaled the end to the policy of driving Jews away . . . and suggested that the Nazis had found a new approach to the Jewish problem” (p.123). Nazi leaders by then knew they had the means to kill people en masse in gas chambers and began constructing sites to do so. “The Final Solution, the annihilation of the Jews of Europe, was in motion” (p.125). But why did so many Germans enthusiastically embrace and participate in state-sponsored killing? Hayes confronts this question in his chapter, “Annihilation: Why This Swift and Sweeping?” and throughout much of the rest of the book. This question probably gives rise to more differences and less consensus among historians than any of the book’s other questions. Here, Hayes surveys the scholarly literature on the subject, in particular Daniel Goldhagen’s Hitler’s Willing Executioners (1996), and Christopher Browning’s Ordinary Men (1992). Goldhagen, in a work which “the public loved and most historians panned” argued that Germans killed Jews “because they wanted to; they wanted to because they universally hated Jews; and they hated Jews because Germans always had – their nation’s culture had been thoroughly and pervasively anti-Semitic for hundreds of years” (p.137-38; curiously, Goldhagen’s provocative work found a particularly receptive audience in the reunited Germany of the 1990s). Browning’s more nuanced study “maintains that anti-Semitic convictions had little to do with the readiness of Germans to commit murder; rather, they acted out of loyalty to one another” (p.138). Hayes attempts to summarize and synthesize these and similar works with several salient points. Above all, he argues, the Nazi regime “succeeded in creating a closed mental world, an ideological echo chamber in which leaders constantly harped on the threat the Jews supposedly constituted and the need for Germans to defend themselves against it” (p.144). Rank and file Nazi perpetrators engaged in self-delusion, developing a “capacity to distract themselves from what they were doing by calling it something else. Perpetrators never owned up to torturing and slaughtering; they always professed to be serving a sanctified purpose that immunized them from the charge of immorality” (p.154). Many embraced anti-Semitism as a “conveniently available form of legitimizing what they had been ordered to do. . . . [T]hey did not kill because they hated their victims, but they decided to hate them because they thought they had to kill them” (p.139). Hayes dismisses the question of his chapter on victims, “Why Didn’t More Jews Fight Back More Often,” as one posed by succeeding generations “from the comfort of living in liberal and law-observing societies” (p.176). There was more Jewish resistance than is commonly realized. Overall, however, the Jewish response to the Nazi onslaught was to “comply with German demands and orders in hopes of preventing them from getting worse” (p.177). Jews took arms only when they knew the alternative was near-certain death. The odds were “stacked against them, because they could not see or could not bear to see what was going to happen to them, because the slimmest chance that some might survive tempted them to avoid committing suicide by fighting back, and because they clung to life as best they could in ever more adverse circumstances” (p.196-97). Hayes thus rejects the provocative charge of Raul Hilberg and Hannah Arendt, two early leaders in the study of the Holocaust who contended in the 1960s that the destruction of European Jewry can be explained primarily through the lack of Jewish resistance and complicity in the killing itself. Their “harsh accusations have not stood up to historical analysis over the past forty years “ (p.178). Hayes nonetheless recognizes that in the ghettos established in Poland and elsewhere in Eastern Europe, usually as a prelude to deportation to death camps, the Nazis frequently delegated responsibility for carrying out German instructions to Jewish Councils, a “diabolically effective” means of minimizing the resources they needed to police the Jews and making them “complicit in their own persecution. In effect, the Nazis applied the tried-and-true colonial practice of indirect rule through favored natives who got privileges or exemptions for punishments in exchange for helping to control everyone else” (p.180). The system of divide and conquer functioned in the camps “to the same diabolical effect that it operated in the ghettos. . . The Germans exploited internal divisions and individuals’ will to live right up until the dissolution of the camps” (p.217). It is, Hayes concludes, both “unfair and inaccurate to hold the Jewish victims responsible for what happened to them.” Whether they lived or died “depended on two things alone: the actions of the Nazi regime and the progress of the Allied armies” (p.195-197). As to why help from the outside was so limited, the subject of the penultimate chapter, “Onlookers,” Hayes examines the individual policies of the countries best situated to help Jewish victims: France, Belgium, the Netherlands, Great Britain and the United States. Overall, a “combination of anti-Semitism and economic and political interests worked to restrict the admission of Jews to other countries throughout the Holocaust and to inhibit other action on their behalf. Sooner or later, every nation that might have helped decided that it had higher priorities than aiding or defending the Jews” (p. 259-60). The same could be said of the major non-governmental organizations, such as the International Committee of the Red Cross, and almost every transnational religious institution, especially the Catholic Church. The fate of the Jews of Europe was “always a matter of secondary importance to everyone but themselves and the regime that wished to kill them” (p.296). In his conclusion, “Aftermath: What Legacies, What Lessons,” Hayes returns to those of us still grappling to comprehend the Holocaust. What transpired during the fateful years 1933-45 was “not mysterious and inscrutable,” he writes. It was “the work of humans acting on familiar human weaknesses and motives: wounded pride, fear, self-righteousness, prejudice, and personal ambition being among the most obvious” (p.342) — qualities hardly in short supply in today’s public sphere. Among my own take away lessons in the aftermath of reading Hayes’ thoughtful work: the word “unfathomable” is unlikely to be used again in these pages to describe the Holocaust. Tom, thanks for sharing these ideas. The particulars of the situation in early 20th century Europe are always worth examining closely. “Unfathomable” is a natural first word to use when confronted with the Holocaust, but sadly a broader perspective of history shows that mass murder happens regularly, before and after the Holocaust. The story of North America includes purposeful genocide of Indigenous people, followed closely by the importation, abuse, and very frequently the murder of Africans, and then African-Americans. Even after formal emancipation from slavery, African Americans have been subjected to brutality, riots, lynching, and poverty. Ill treatment of Indigenous and African-American people continues today. Mass murder occurred in Stalin’s Russia, Mao’s China, and Pol Pot’s Cambodia. Genocide occurred in Uganda. Even today, we see horrific abuses in Syria and Yemen. This is off the top of my head. One could easily spend some time compiling a very long list of historical mass murders. The Holocaust is no aberration. I don’t get a sense from your review that Hayes delves into this line of thinking. I hope we never have to make a real comparison of the world in the twenty-teens to that of the nineteen thirties, but it’s not difficult to see some of what Hayes describes in today’s US and Europe: demonization of the most marginalized people, attacks on the free press, and complicit or distracted followers of authoritarians. I hope we can learn from the long history of the world’s most “unfathomable” events. Thanks, Dave. Hayes stays away, deliberately I think, from comparing the Holocaust to other instances of genocide. But the review I’m currently working on, to appear in the next couple of weeks, addresses that issue head on. Stay tuned. I don’t see anywhere near the same scholarly output out there on Native Americans in the age of western expansion. With so much of academia fixated on the rapaciousness of Europeans and their ancestors in America (e.g., as colonialists and slave holders), this question would seem primed for extensive scholarly treatment. Maybe I’m just not looking in the right places. Thank you for the review. The Klemperer diary gives a day-by-day description of what is happening. I have mentioned it before, but it still seems relevant here. Klemperer, a WWI vet with an Aryan wife, watches in disgust, then outrage, then horror, but he and his wife are invested in being German, and by the time that they might have decided to leave, it is too late. I agree that calling it “unfathomable” is not the best way to go, but it can also be a humble acknowledgement of our inability to really explain/accept the fact that it happened. Some witches’ brews of factors explode, and some don’t. That is not to say that analysis is pointless, but there are always so many variables, that the ingredients are never quite the same. Thanks, Dwight, nice points. Klemperer’s book is mentioned in Hayes’ book; it’s one of the best original sources on the Holocaust. Thanks Tom. As usual, very clear and insightful. One cannot help but draw some parallels to our illustrious leader: Herr Donald. Great Review, Tom! It’s obvious that even in “the land of Beethoven and Bach, Hegel and Kant,” there are criminals, part of them behind bars and part not so, and it happens that some come to rule the country. It also happens that ordinary or remarkable people become criminals when they come to rule the country. As to lack of resistance to tyranny, it is not synonymous with cowardice. it takes courage to resist and ordinary people, even otherwise remarkable one, are not necessarily courageous. Complicity in killing is something else: accomplices in killing are criminals. But criminals are not uncommon of course, irrespective of religious or social background.